Well, here I am, writing from personal experience. Contrary to the popular belief, being a human doormat is not bad, not bad at all. I do not understand why people consider it pathetic, or why we doormats are considered cowardly. I can definitely say that is not the case at all. 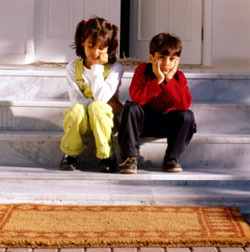 If you are a naturally easy going and laid back person, it might be worthwhile to try being a doormat for a few days. If you're the one who just wants to shirk responsibilities, it might be imperative for you. If, on the other hand, you're the dynamic kind, all set out to lead the world, you just might want to take a break for a few days, and this might be a good proposition. The only danger in actually acting like a doormat for a while is that, after a while, it becomes difficult to distinguish your assumed passivity from your earlier exuberance. It is certainly an addictive behavior. It not only allows you to be as lazy as you want to be, it also makes you feel very useful, without actually doing anything. To those with a thing for the melodramatic, or a hyperactive imagination, the idea of being a self proclaimed martyr might carry immense appeal. Your colleagues will soon give you the very honorable prefix of 'Saint'. Doesn't it sound wonderful? And all this without actually doing anything! What more could one ask for? I believe all humans are characteristically lazy. Somehow, the idea of rest, having less, easier work to do attracts us immediately. Don't panic, it's a very natural trait. Or are you the kind that thinks that work is everything and you won't survive without doing things? If you are, then pray, tell me, why do we create devices like cars, telephones, computers, vacuum cleaners, dishwashers, micro-wave ovens etc, if not for sheer convenience? And from where does this convenience arise? Isn't the answer obvious? It's laziness, of course. In my opinion, the proverb 'Necessity is the mother of invention' ought to be changed to 'Laziness is the mother of invention.' Quite logical, don't you think so? It's about time for me to define the term 'doormat', I guess. I think everyone has the general idea about what it is. Opinions differ, of course, and mine might differ from yours, nothing wrong with that. Each to his/her (can't leave out the females; I am a staunch feminist!) own. It's a free world, right? Anyway, let us proceed to the actual definition. I won't cite a dictionary or anything, frankly because I feel too lazy at present to get up from the very comfortable position I'm in and hunt for my dictionary, and besides, I'm not even sure that I'll find it there. Maybe the next time I get up I'll look for it, that is, if I remember. Enough beating about the bush. I'm moving to the definition, but a brief history of how I came to hear the word in the first place might be appropriate. I owe it all to The Mask. It all happened quite a few years back, when I was young and innocent and carefree (not that I'm old and guilty and worried now, but that's another matter altogether), that I happened to see this episode on the television about reverse psychology in the cartoon series of The Mask. Anyone seen the cartoon series? It's pretty cool. Anyway, I cannot recollect the title of this particular episode, but it was the one in which Stanley decides that he's fed up of his life and takes up reverse psychology as the cure, in a desperate attempt to make his life more colorful. Everything seems fine till the world is in danger and the mask simply wouldn't work on the new Stanley. So, to save the world, he has to let go of his ego and cling to the feet of the bad guy (I forget if it was the balloon guy or the scientist guy). The mask accepts the old Stanley and The Mask saves the world yet again. It was during this episode that I heard the word 'human doormat'. It was used to define Stanley, and this was the word which brought the magic of the mask back. Pretty cool, eh? We doormats saving the world! Unknown to me, this idea began to take root in my head (at least, that's what I think, I don't claim to be correct; I'm no psychologist! ), and slowly modified my already lazy disposition to become even more so. So much so, that now, after the period of a few years, I think I'm definitely on my way to becoming a doormat. The process, unfortunately, is a very gradual one, and I have reasons to believe that it might take me quite a few more years, if I do not deviate. For a mercurial nature like mine, it is difficult to predict anything more than a few seconds. A doormat, to my mind, is an object that is pretty useful, but not essential. You can use a doormat for convenience, but it isn't essential. The doormat just sits outside your door, relaxed and laid back, inadvertently performing the task of keeping your house clean by harboring all the filth from the shoes that are wiped on it. Its job is very passive, it doesn't have to do anything except sitting there. You, who use a doormat are partially one as well, because you're using it to save you the trouble of cleaning the floor all over again whenever someone comes in with dirty shoes. Where there's laziness, there's a doormat. Or should I take a leaf out of J.K. Rowling's book and enrich the English vocabulary with a new word? 'Doormattiness' looks and sounds good. Where there's laziness, there's doormattiness. Cool, man. We doormats are positively brilliant. Oh, I forgot to mention that. To be a perfect doormat, you need a reasonably high IQ, and a certain amount of innovation, creativity and imagination. It's not easy being lazy, you know. You have to work out short cuts for everything, be it a problem in mathematics or carrying stuff from one place to another, if you have a streak of doormattiness (I love this word!) in you, you have to be capable of thinking out ways to get the thing done with minimum input from your part. I concede to the fact that the first time the work is done, the workload will seem a bit more than normal, but think of it this way, the few seconds of mental work that you put in to devise your strategy, make your life easier thereafter. Isn't it worth it? Now I'm in a position to give a proper definition of 'doormat'. A 'doormat' can be described as a person who is essentially introverted and shy by nature, at least for the particular period of time during which he/she is in the 'doormat mode', having a brilliant mind with ample creative, inventive and imaginary skills and an immense amount of laziness, passivity and desire for anonymity and easy going lifestyle, whose modus operandi is choosing a task where he/she has very little active part to play, and yet performs some useful work, though rarely is the person recognized or acknowledged or referred to except in a derogatory manner. This definition is a fusion of my idea and the conventional understanding of a doormat. One myth needs to be blasted here, though. It is generally contended that doormats are people possessing poor or no will power and easily bend to the wishes of others, thereby getting exploited by the not-so-conscientious people. I beg to disagree. Will power has nothing to do with being a doormat. As for being exploited by people, just because some doormats are too simple to understand the corrupt nature of others, and as a result, undue advantage is taken of them, does not mean that all of us are like that. A clever doormat will just by-pass the exploitative work heaped on him. Clever doormats are not very popular, though, because people tend to fear them. Simple doormats are looked down upon, though most people wouldn't mind getting their work done by them. The intermediate stage, the normal doormats are the most common, for, almost the entire real world falls into that category. the simple doormats, also discussed before. The first and the third types are merely hypothetical situations. No such individuals can, or will exist. It is not realistic. It is the normal or intermediary doormats that rule the world. These people may range from slightly doormatty (another new term! Wow! I am brilliant!) to nearly completely doormatty. These are the people we see around us all the time. The clever ones go on to become great inventors, scientists etc. The simple ones allow themselves to get exploited till their idea of the world becomes so distorted that they turn to crime. When they do, these are the most dangerous kinds of criminals, because they've stopped believing that the world is capable of any good. They do not do any good deeds merely because they do not expect them. The criminals, generally, though, belong to the normal class of doormats, although the clever class cannot be said to be free of them. Having defined and classified doormats, I think my job is over. I'd originally planned to write a whole book on doormats, source of inspiration being Judy of 'Daddy-long-legs', but now I think that is a colossal task for me, hence I opted out, true to my doormattiness. So, I conclude by saying that since everyone is a doormat in someway or the other, it would be proper to accept the fact and treat the more apparent doormats with a bit more respect. Doormats are essentially good beings, and prefer to remain that way until circumstances force them to change. Where would the world be without doormats? We would probably be living in pre historic conditions all through the past as well as for the remainder of the natural existence of the human race. Progress, development, modernity ' call it what you will, it all arises from the underlying, undeniable, inherent laziness possessed by all humans (in different degrees, though) which is one of the things which makes you a partial, if not a complete, doormat. Be proud.